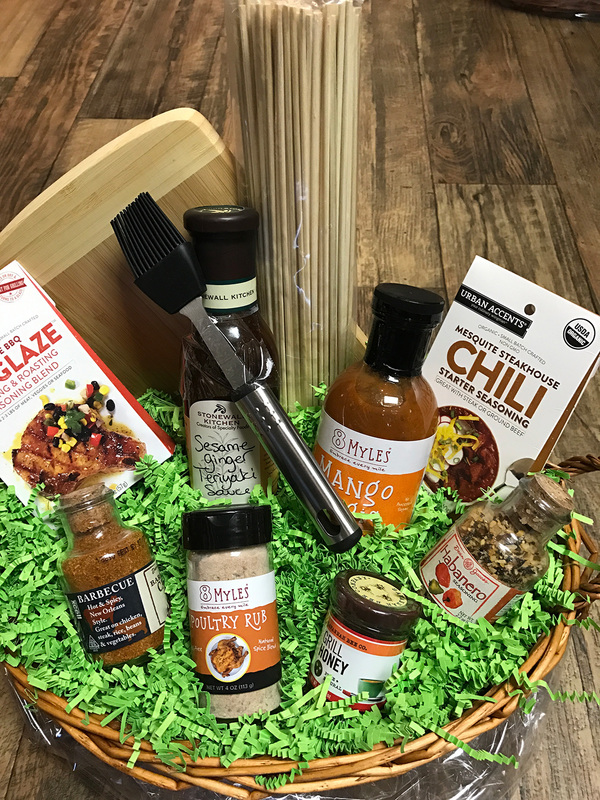 Gourmet gift baskets—a Dash of Thyme specialty! Send a hand-crafted gift filled with BBQ goodies just perfect for the foodie in your life. Your basket may include some of the following: rubs, seasonings, sauces, marinades, cutting boards and barbecue supplies/essentials. Please note that contents may vary from those pictured and are subject to basket size and price. Medium basket shown in photo. At checkout, add a message to your gift and we’ll include it on a hand-written note for a personal touch. Be sure to indicate if you have any allergy restrictions as well. Please note that contents may vary from those pictured. Sorry, no substitutions available. We will create basket filled with hand-picked seasonal goods, subject to freshness and availability! All baskets require an assembly fee based on size, which is added to the price. It includes the choosing and arrangement of contents as well as the basket, straw, shrink wrap, bow and gift card.